College living arrangements can be scary sometimes, especially if you're a freshman moving into a dorm with a complete stranger. You don't know this person, you don't know their habits, or how they will react under any and all circumstances that college will bring. You could end up rooming with an amazing person who will become one of your closest friends (Hi Jacqueline, so glad we got paired up! ), someone who becomes your worst nightmare, or anything in between. Even if you aren't a freshman, having a roommate is a thing that you have to deal with all throughout college, and also in the real world, so these tips are good for everyone! This is easier in college when you're given the person's email address, phone number, and can stalk them on Facebook for hours on end. The second I got my roommate's name I sent her a message on Facebook (though she didn't actually see it until we became friends, check your "Other" inbox messages!) and introduced myself. I also emailed her in case she didn't get my message, and we sent a few small talk emails back and forth. I suggested that we fill out a roommate questionnaire to get an overview of what each other's personalities/living habits are like, and if we had any specific pet peeves (turns out both of us hate the sound of people clipping their nails! ), likes/dislikes, etc. This was the exact one my roommate and I used! Some questions are a little repetitive, but it's extremely thorough and I think it really helped in getting to know my roommate. When you do get together in person, get a meal together or something and just start talking about yourselves. You'll probably go over a lot of what you did online, but still, it's sometimes good to repeat yourself! Telling someone what you want or how you feel about something is sometimes difficult, and it always seems to be harder when that person lives with you. If you don't like something in your room, tell your roommate. If she's always bringing people over without asking you, talking too loud when you're trying to study, or turning lights on when you're trying to sleep, you have to say something! I know it's a little weird when you don't know the person that well, but I promise things will get better if you express your worries/complaints in a nice, calm manor (unless your roommate turns out to be a psycho or unreasonable, then I'm sorry). If you're uncomfortable with something, talk about it when the problem starts to avoid the "you never said anything before" argument, and come up with a solution that is good for both of you. Physically and emotionally, figure out room divisions (if any), and understand that your roommate will at some point want some alone time. If you see her (or him!) feeling down, ask what's wrong, but if they say nothing, don't try to push them! Let them be and check in on them in a few hours. As for the room, make sure your stuff stays within your designated area to keep from having unnecessary arguments. Yes, it's great when you hear stories about college roommates becoming best friends, but it's okay if that doesn't happen! It's more common to be friendly, rather than a friend with your roommate. As long as you are getting along in the room, you've succeeded! Don't try to force a friendship that isn't there, and don't completely ignore one another. In the first few weeks I would suggest you be friendly, ask how they're doing, how their classes are, and invite them to do things with you like go grab coffee or see a free movie that your campus is hosting. If a friendship forms, great! If it doesn't, don't stress yourself out about it. On another note, you could start off the year being extremely close with your roommate, but end the year being completely annoyed with them. This happens too, and you have to understand that some roommate relationships will fluctuate, and don't always end with friendship. Speaking of being friends, if you're planning on living with friends, make sure you have somewhat similar living habits! Sometimes friends don't make the best roommates, and it can lead to a falling out. Before making any serious plans, ask yourself, "Do we go to bed at similar times?" "What are our study habits?" "Are our cleanliness levels similar?" and other similar questions. If your friend lives in a radically different way, she may not be the best person to room with. Even if you and your friends seem like perfect matches, it's still good to go over any room/apartment/house concerns that you guys may have including cleaning schedules, noise levels, room temperatures, etc. If you follow these tips, you'll hopefully have a great roommate experience! I was lucky that I got paired with someone who I now call one of my best friends, but that isn't always the case. Do you have any roommate advice that you swear by? Have you had a traumatic or great roommate experience? Let me know in the comments! 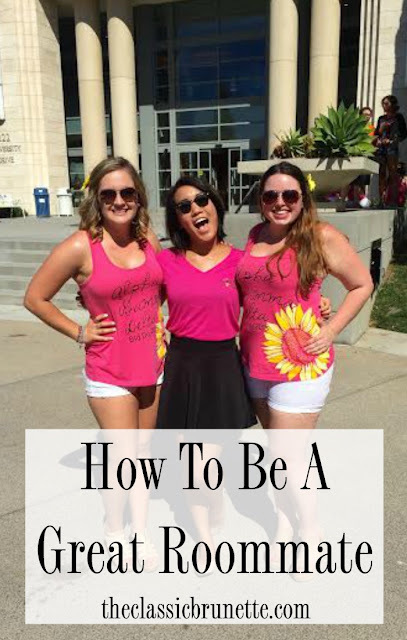 And don't forget to check out my post with advice for freshman year! Great tips! My roommates in first year were all nice enough but we definitely did not agree on many things. In the end we could live/tolerate each other and we had our bonding moments but we were just too different! This is great! I'm a freshman in college and currently living with a roommate. I'm having trouble getting used to living with another person and getting used to her habits. I lived off-campus/at home with my Mom since college is around the corner BUT for Leadership trips the ladies did gather to set some ground rules for commune living!! Once you did this, it makes everyone accountable and eliminates the "I didn't know..." type of excuses that lead to dorm room fallout! Thank you for taking the time to comment! I read and appreciate every one! Hi I'm Sami! A twenty-something college grad born and raised in California but now living in Seattle. I'm a lover of all things blush and gold, fun lipsticks, and any combination of sweet and salty. The Classic Brunette is your go to spot for fashion trends, beauty reviews and lifestyle tips. Visit Sami's profile on Pinterest.